Just back from the Hong Kong leg of Future Ventures' initial public offer roadshow, Kishore Biyani was jet-lagged throughout Saturday morning. However, by noon, he was ready to cheer for India in the cricket world cup final at the Wankhede stadium in Mumbai. But six hours and two body blows by Lasith Malinga later, when India was at 31 for 2, it seemed a re-run of a familiar script. At the stage when India was at 114 for 3 and almost everybody thought that our 28-year wait would get longer, Biyani kept the faith and tweeted to his daughter in New York: "It's nt ovr yet." Image: MS Dhoni asks for a review by the third umpire for the wicket of Nuwan Kulasekara. Mahendra Singh Dhoni (MSD), India's Captain Zen, made sure it wasn't. Battling back spasms and forgettable batting form, he led fellow warriors to do a miracle in the middle. MSD was the youth icon during the 2007 world cup too, just three years into his career. But what India saw at Wankhede reaffirmed its belief in the turnaround specialist. Can Indian CEOs do with their managers and company bottom lines what MSD has done with his team? Can his leadership values become the mantra of success in corporate boardrooms? 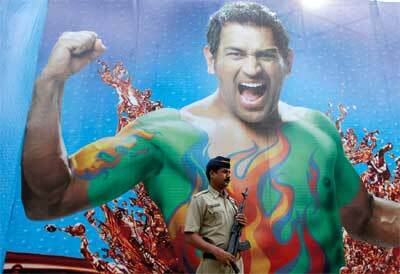 Image: A police officer stands guard under a poster of Dhoni outside of Wankhede Stadium. Biyani, for one, has always bet on MSD's leadership skills. Three years ago, he signed him up as a brand ambassador for Fashion Big Bazaar. 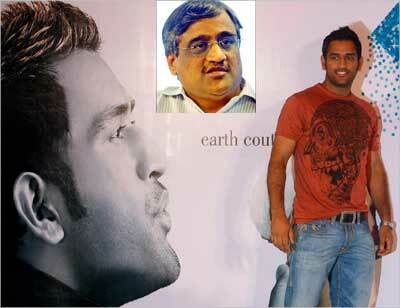 "I have always been the biggest advocate of Dhoni's leadership skills. He is not afraid of taking decisions. In the final, he came ahead of Yuvraj to take the bull by the horns," quips Biyani. For him, Dhoni represents the new India that is rising from the smaller towns. "They are confident about themselves and are changing perceptions with their strong sense of purpose," Biyani says. Image: Dhoni poses during the Kolkata Fashion Week in 2009. Inset: Kishore Biyani. Dhoni has all that and much more. As Team India showed its weak spots match after match, he remained unflappable, always backing his boys. Pramit Jhaveri, CEO of Citi India, is no stranger to leading a pack from the front in crunch situations. But after the final - like most other CEOs who watched the match from corporate box seats - he has been awestruck by MSD and his boys. "Dhoni has always struck me as having the extraordinary qualities of a true leader. He is mature, visionary, strategic, positive, confident, calm, composed. On Saturday, all these elements were on display and will leave an everlasting impression," Jhaveri says. Image: A 2009 file photo of Mahendra Singh Dhoni. Inset: Pramit Jhaveri. Television commentor Harsha Bhogle, who doubles up as a management consultant, couldn't agree more. The win against Australia, Pakistan and Sri Lanka didn't seem to impact Dhoni. You may feel there's something odd about this, but if you think, this is the temperament that can lead you to win matches. "Not worrying much about outcomes, but playing on," he said. Image: A 2006 file photo of Dhoni in Lahore. Inset: Harsha Bhogle. 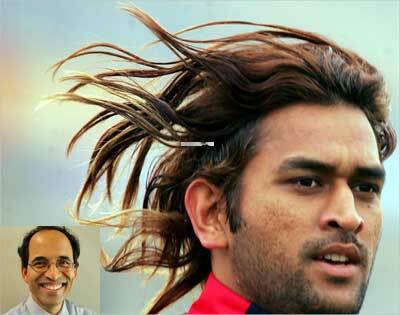 All that Sanjeev Aga, the recently-retired boss of Idea Cellular, has to say about Dhoni is, "What a cricketer, sirjee." Aga watched the final, sitting on the edge of his seat. 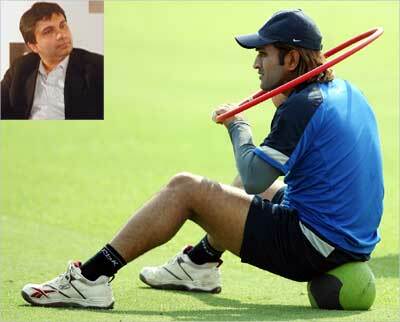 Aga admires Dhoni's selfless style. "His cricketing sense is strategic, sophisticated and evolved. He has balance and perspective without being demonstrative or demanding. He quietly extracts peak potential from his team. When the country will go overboard in singing his praises, he will realise the role of luck and circumstance, and will remain unassuming." 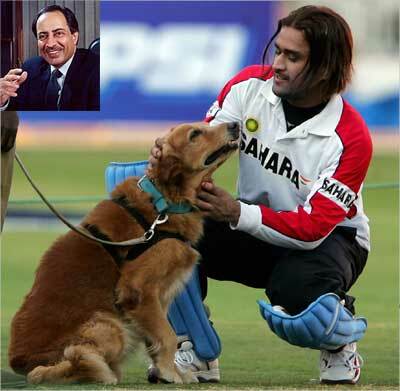 Image: A 2005 file photo of Dhoni playing with a police sniffer dog. Inset: Sanjeev Aga. Also, Aga adds, he has the courage which comes when your personality is not imprisoned in false values. 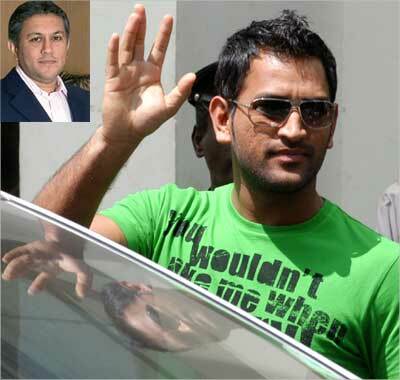 Extracting the best from the team becomes easier for Dhoni due to his democratic functioning. So, if Sachin Tendulkar is asked to counsel the batsmen, Zaheer Khan becomes the mentor for the speedsters in the team. He is humble and a great listener. He acknowledges what a Sachin can bring to the table and respects that. "There is just no arrogance in the man," says Saugato Gupta, Marico's CEO. Image: Dhoni sits on a ball as he holds a ring. Inset: Saugato Gupta. Even though Dhoni takes the final call, team mates say he is always open to suggestions and doesn't hesitate to change plans. He's always willing to go with the team's collective instincts, from opting for a review or changing a set bowler at the last minute. "Dhoni always encourages the team members when chips are down. It shows what these softer skills can help you achieve," said N Srinivasan, MD, India Cements and BCCI secretary. 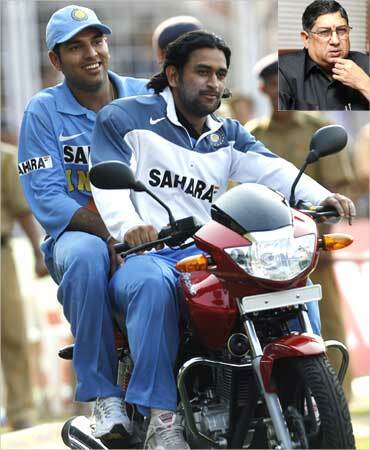 Image: A 2006 file photo of Dhoni (R) and Yuvraj Singh on a motorcycle. Inset: N Srinivasan. Srinivasan gets to see Dhoni quite closely, as India Cements owns Indian Premier League franchise Chennai Super Kings, led by Dhoni. Prashant Ruia, group CEO, Essar, sums it up perfectly: "Under Dhoni, everybody works together, has fun together and enjoys himself. Yet, each one is committed and each one contributes. That's what a leader does." 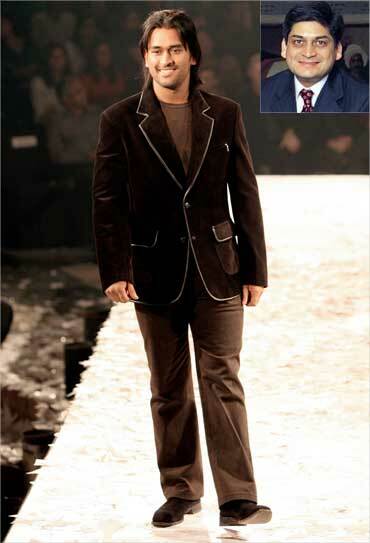 Image: Dhoni presents a creation by Indian designers Rohit Gandhi and Rahul Khanna in 2006. Inset: Prashant Ruia. Can Nooyi bring back the fizz in Pepsi?